Grand Canyon Lookout Studio is located on the the edge of the Grand Canyon South Rim, it is a spot where tradition, history and character all come together like winter air pressing up the edges of the cliffs at the canyon. If you haven’t been to the Lookout Studio, then you should take some time (or commit a large part of your Grand Canyon itinerary) to exploring this spectacular part of the Canyon. This is where nature, culture and history meld together to provide a richer experience of seeing the Grand Canyon. The natural setting perfectly complements the site, with plenty of breathtaking views. During times when the weather permits, you can hop onto either one of the two outdoor overlooks for a closer inspection. The Studio Lookout is another Grand Canyon masterpiece created by notable architect Mary Colter. The Studio Lookout isn’t just another run-of-the-mill architecture. The inspiration for the overall design and build came from the Santa Fe Railway. Mary Colter came up with an artistic vision that holds form and function in a contemplative balance. Mary Colter had a unique eye for designing Grand Canyon features. Her vision for the Studio Lookout included a building using only native stone found in the Grand Canyon; with an irregular roof that served a seamless aesthetic transition from the building to the Grand Canyon’s rim. Moreover, the Studio Lookout had that unique, rustic charm with the jagged rocks designed to emulate the region’s indigenous structures. When you first see the Studio Lookout, you’d believe that it was part of the natural landscape. The ingenious blending of wood, local stone and the merging of it with the immediate vicinity, mimics 12th century Native American construction design. Mary Colter’s eye for natural beauty was finally coined, and is known as “Parkitecture”, where the style of building is made with the natural surroundings in mind. It is now being applied to many other National Parks, thanks to Frederick Law, a landscape architect. 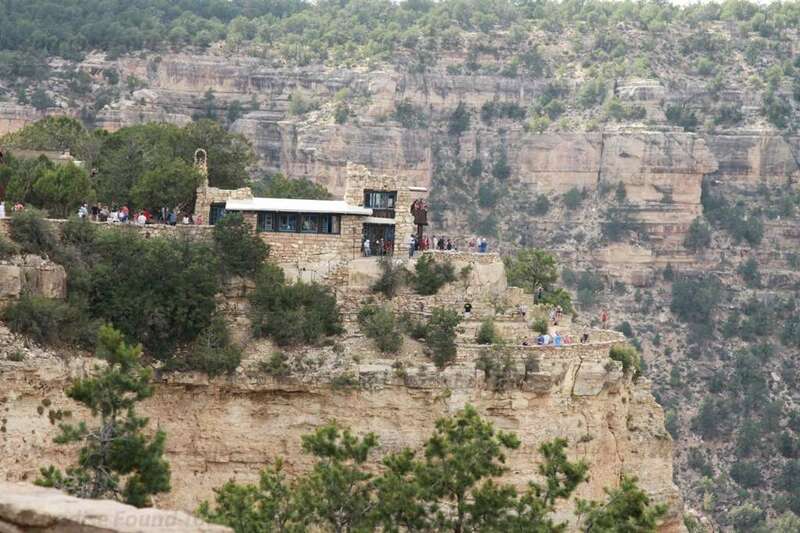 The Grand Canyon Lookout Studio was completed in the same time Hermit’s Rest was finished in 1914. Both Grand Canyon features stand around eight miles apart. Lookout Studio is one of six Mary Colter architecture designs that grace the Grand Canyon South Rim. It is now a member of the National Register of Historic Places. The five others are Desert View Watchtower, Phantom Ranch, Hopi House, Hermit’s Rest and Bright Angel Lodge. You will be able to see the rubble building at the edge of the Grand Canyon South rim. The walls have that irregular parapet which houses the structure’s chimneys. There was a time when the roof had some stone piles scattered about, making it look like it had fallen into disrepair. There are 3 levels to the Lookout Studio. The main level features a magnificent enclosed area for viewing. There’s a shop, a small observation tower and a viewing platform on the lower decks. Step inside and you’ll see the wood viga roof still visible. The other aspects of the Lookout Studio have long since undergone repair and renovation. It’s one of the few Mary Colter structure that gets plenty of natural light, thanks to its array of large interior windows. Before, visitors had the option to peer through farther via the high-tech telescope perched on the Lookout Studio porch, but now it’s on display at the Bright Angel Lodge. Stand atop the Lookout Studio and you’ll be able to see mule riders on their way down to the Canyon. The Lookout Studio has the same features as the Hopi House in a way that it emulated the Pueblo Indian’s stone dwellings found in the southwest. Irregular stones make up the chimneys, cemented in place with the surrounding soil and debris. Plants sprouted and grew, which made the building look more natural in its surroundings. There’s a lounge inside the studio. 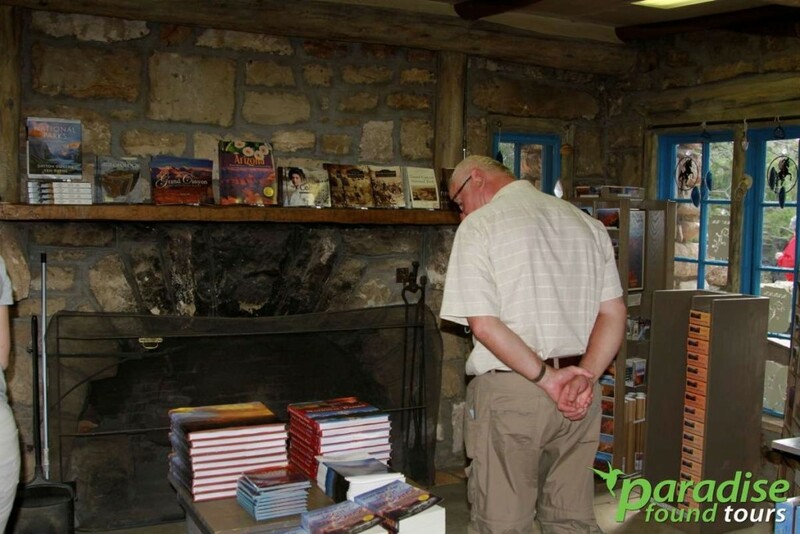 You can use the fireplace to warm up after an outdoor adventure, or view the numerous artworks and postcards for sale. The Grand Canyon Lookout Studio has always had that “work in progress” feeling. During the early 20th century, the visitors were able to see the Grand Canyon’s interiors and check the trails using large telescopes installed along the building’s wide verandas. 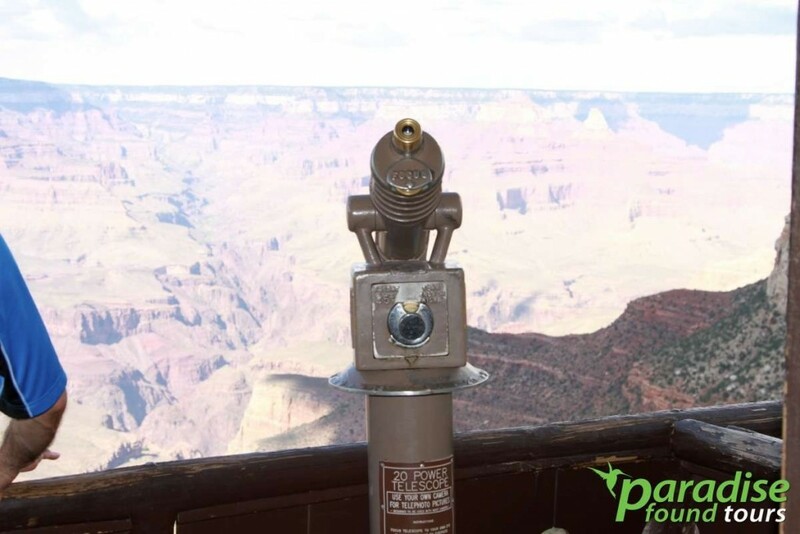 Most tourists went to the Lookout Studio to get mules and trek into the Canyon’s massive interior to Phantom Ranch, Plateau Point and Indian Garden. The Studio served as a rest point from where the visitors could talk about their memorable mule expeditions, or for waiting and seeing what they have missed when they failed to complete the trip. It was a natural setting for a gathering place. Visitors could cozy up when the temperature dropped, read a novel by the fire, or converse with other park guests. Come night time, they could use the telescopes to peer into the great sky and see the magnificent stars on a great backdrop. The neighboring Kolb Studio proved to be such a success that the Lookout Studio was created to be its competitor. Lookout Studio was created to be a photography studio, much like Kolbs was. It was built in near the proximity and proved to be a sore spot for the brothers Kolb. Kolb Studio was built 10 years before Lookout Studio. It was a photography studio that capitalized on the Grand Canyon’s natural beauty. The brothers Kolb sold shots of the Grand Canyon’s magnificent feature and displayed their wares out on their souvenir store and gift shop. Kolb Studio was a resounding success until the Lookout Studios was built. In direct response to the photography shop, the Lookout Studio was built just a hundred yards away. The resulting building created a bottleneck where tourists were somewhat restricted on their way to the Kolb Studio (people coming in from El Tovar first saw Lookout Studio instead of Kolb Studio). The close competition got on the nerves of the Kolb brothers, because the Studio Lookout also offered the same kind of photography wares they were selling. Emery Kolb and Ellsworth Kolb make up the Kolb brothers. They found the Kolb Studio, which was first started at the trailhead of the Bright Angel. Here, the two men gained popularity over their creation of a Colorado River motion picture, snaking its way across the whole of the Grand Canyon. The Kolb Studio was officially opened in 1903, and was available for people who went up the Fred Harvey mule rides along the Bright Angel Trail. At first, the Kolb Studio was built on a small cave at the Grand Canyon’s walls. The entrance was a makeshift blanket, which also created a virtual darkroom. A few years after the Kolb Studio was created, the brothers were able to build a two-story foundation made out of wood into the canyon wall’s rock shelf. Ellsworth and Emery went down to the Colorado River in 1912 and recorded their adventure on a movie camera. The trip started with them embarking in Green River in Wyoming, and the entire Colorado River expedition took roughly 2 months to complete. The brothers ended in Needles, California. When the trip was done the 2 brothers immediately started working in promoting the movie they made. They went on a world tour and returned to the Grand Canyon. During this time, they started showing the movie every day in a makeshift auditorium right at the Kolb Studio. This was the latest addition in a 3-story expansion that included living quarters. Then as the business went on, Ellsworth lost interest and moved to Los Angeles but his brother Emery stayed and operated the Kolb Studio until his passing in 1976. The historic Kolb Studio is now open to the general public all year long. It now has some staple tourist attractions such as an information center, a bookstore and an exhibit venue, courtesy of non-profit Grand Canyon Association. What the store earns from the merchandise are used for care and restoration of Kolb Studio. Recently, the Kolb Studio underwent a major remodeling back in 2004, just in time for the Kolb Studio Centennial. It is a tribute to the brother’s remarkable photography of the mule riders making their way through the Grand Canyon. Stepping inside the Lookout Studio will transport you to a far-away time in history. One of the best viewpoints located here will let you see the awesome California Condor, considered to be the largest North American bird. From time to time, you’ll see this majestic animal soaring through the Grand Canyon with ease. Check out the view terrace and make sure you have some spare change at hand. You certainly won’t want to miss out seeing the California Condor and all the other winged animals taking flight in the Grand Canyon! The Grand Canyon Lookout Studio holds the distinction of being a hotspot for one of America’s rarest birds, the Gymnogyps californianus. You can stand along the wide terraces and see the whole interior of the Grand Canyon, or use the many coin-operated telescopes for a chance to see the beautiful condors in their natural habitats, flying free against the Grand Canyon backdrop. You may also stand on the paved trails nearby Lookout Studio, see the stone walls running along the rim and look up to see the birds soaring high, with their wings spread out and their triangular feathers visible under the bright sunlight. You can find the Lookout Studio if you continue westward after the Bright Angel Lodge. The famous landmark is open all year round, with hours varying per season. 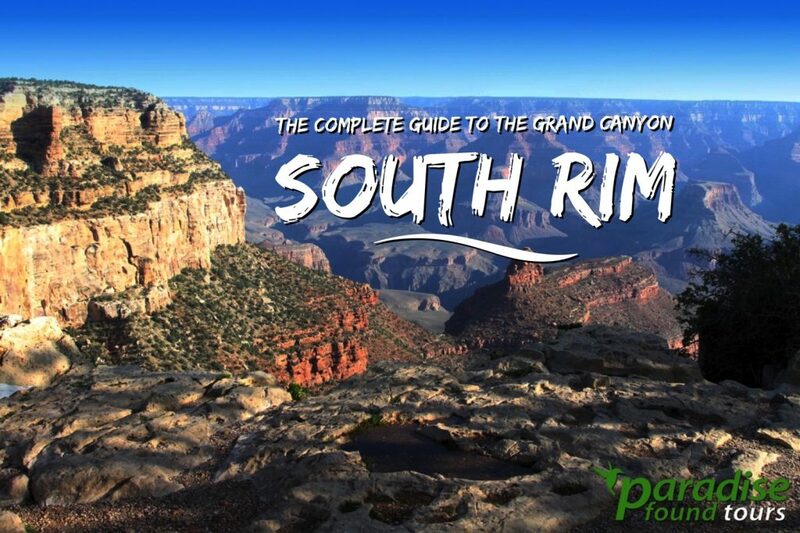 Check out the selection of books and photography highlighting the Grand Canyon. There’s also some rocks and fossil specimen on display.